It’s been a while since I’ve posted anything here. I’ve been busy, but not with anything that has really been worth making a point to write about, so this is a post to sort of get caught up on what’s been going on. Most of the time has been spent painting. I’ve painted baseboards; I’ve painted molding; I’ve painted doors; I’ve painted the kitchen; and I’ve painted the kitchen cabinets. We finally got the new floor put in the kitchen. It’s the same sheet vinyl that we used for the dining room. After all the work to get things back to “normal” after the flood, it feels good to accomplish something that was on our to do list before the flood. While we were in the middle of installing the floor in the kitchen, the stove and microwave stopped working. We checked the breaker box, and found that none of them had been tripped (and turned them all off and on to double-check). About half an hour later, we noticed that the electricity to those two outlets had come back on. The next day it quit working again without anyone using anything plugged into either outlet (the microwave was running the first time it had happened), so we knew that it had to be unrelated to the microwave. On Monday, we called an electrician. The two of them spent two hours in the attic looking for the problem before they finally found the small section of burnt wire that was causing the problem. I’m very thankful that the electricity simply quit working, when it easily could have started a fire. 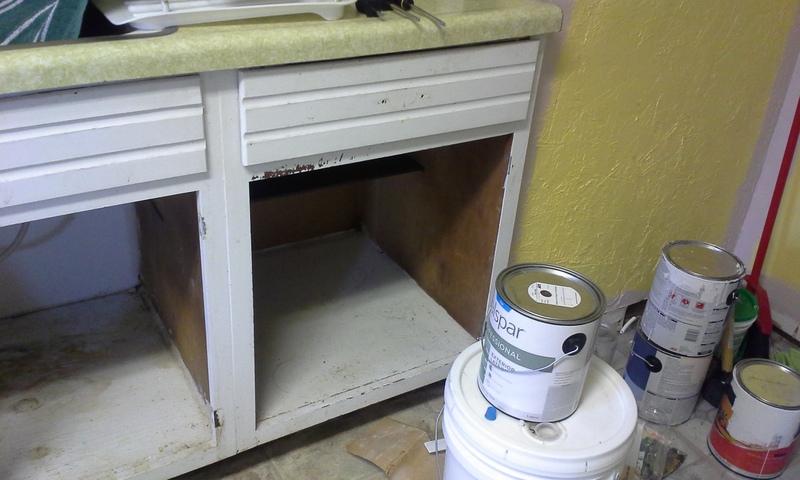 After getting side-tracked with the electrical problems, we did manage to finish installing the kitchen floor and was able to get all of the baseboards painted and put back in. 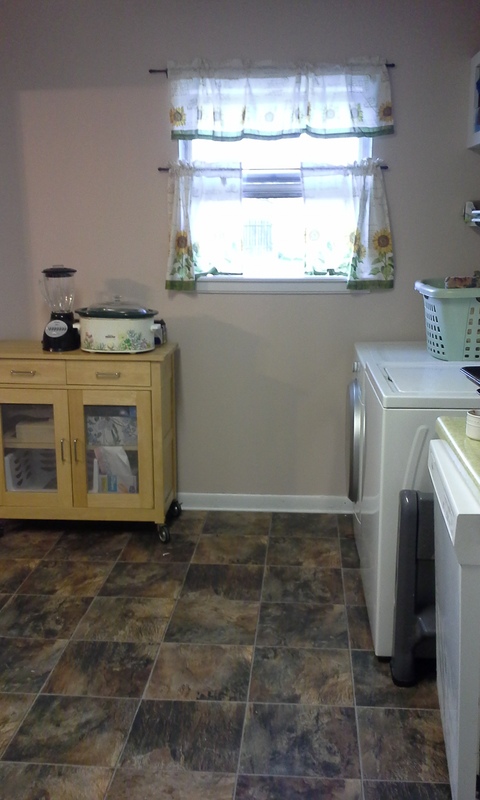 The kitchen is now completely finished except for a few cabinet doors that need new hinges. 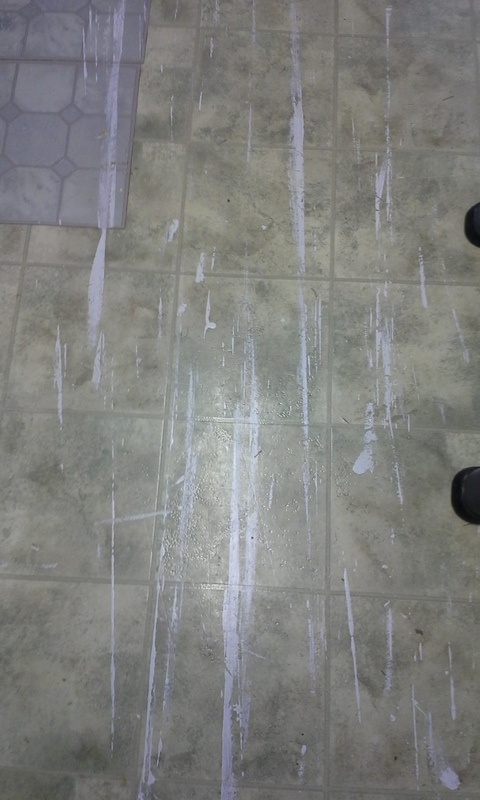 While I was busy (probably too busy) with painting the kitchen cabinets, one of the children–in an ill-advised attempt to “help”–spilled about a half-gallon of paint in the bedroom. Then after an attempt to clean it up, covered it up with toys and laundry–I guess in hopes that we wouldn’t notice. 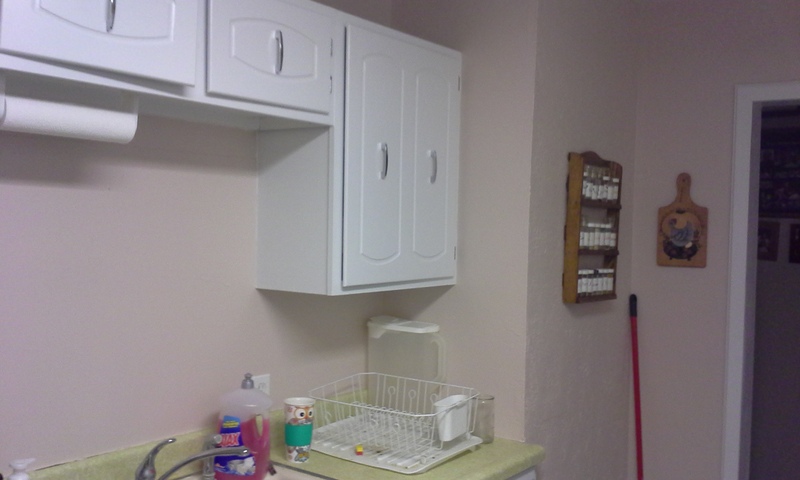 Being focused on the cabinets, I didn’t notice for three days. By the time I discovered it, some of the paint had already dried, but most of it hadn’t. We spent about two weeks trying to clean the paint out of the carpet (most of the work was done by the child who spilled it) before deciding that it was a lost cause. The actual paint came out, but the color did not. We are going to try to replace the affected area with a remnant that we saved from when the new carpet was installed. I’m hoping that I can work on it Saturday without any interruptions. Our self-imposed deadline to finish the work on the house came and went. The house is not still ready to put on the market–mostly exterior things that need to be done before I feel like it should be listed–but we are continuing to plug away at it. And I am trying to be patient. I know that the timing is in God’s hands, but in the day-to-day work on the projects that don’t seem to be getting done and the new ones that keep cropping up, I’m finding it hard to focus on God’s timing instead of my own.